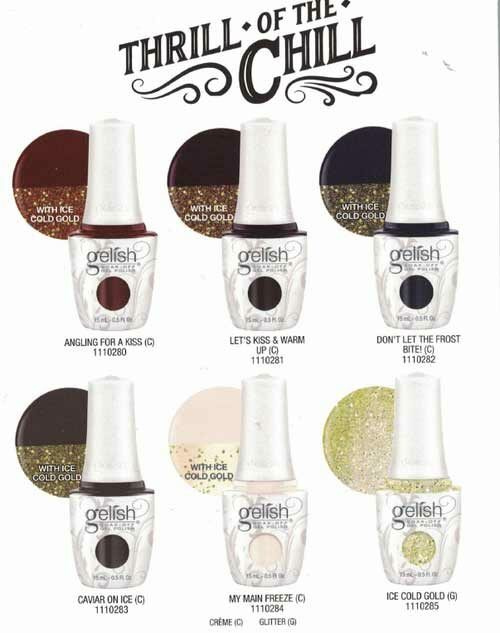 Gelish Make A Splash Collection – Includes a FREE Gelish Cleanser 120ML! Gelish Make A Splash Collection: Includes 7 fabulous colours + A FREE Gelish Cleanser 120ML! Polygel Trial Kit contains : Natural Clear, 4oz Slip Solution, Tube Key, Multi-purpose Tool PolyGel: A revolutionary nail enhancement – lighter, stronger and easy to use. It is a hybrid between acrylic and hard gel • Requires no mixing as is premixed • More flexible than acrylic • Stronger than hard gel • 23% lighter than acrylic & 16% lighter than hard gel • Odour & airborne dust free • Produces a longer lasting, beautiful, natural finish • Unlimited play time • Less waste as product comes with a tube key • No heat spike. • Cures in 30 seconds under a 36 watt LED. • Available in 6 shades. • 30 – 40 applications For professional users, a user manual is available. Please email us on sales@auswax.com.au Please note : To use the polygel system it is recommended to use the following products - Gelish Pro Bond, Gelish pH Bond & Gelish Top It Off. These items do not come in the kit but can be purchased individually. Gelish Dip & Buff. Up to 14 days wear – no UV/LED light needed, easy to soak off allergy free, acrylic system. Available in over 120 stunning shades that match Gelish Soak-Off Gel Polish. DIP Gelish Dip Starter Kit contains the following products : 1 x Gelish Dip Prep 1 x Gelish Dip Base 1 x Gelish Dip Activator 1 x Gelish Dip Top 1 x Gelish Dip Brush Restorer 1 x Gelish Dip neutral shade 1 x Buffer 100/180 Grit Gelish Dip Prep: Balances the nail to a neutral PH and removes any surface oils. To be used prior to application of Gelish Dip Base Coat to ensure long lasting adhesion of the Gelish Dip system. Gelish Dip Base: Prepares and protects the natural nail ensuring optimal adhesion. To be used after applying Gelish Dip Prep and before applying Gelish Dip coloured powder. Gelish Dip Activator: Helps to speed the drying process and provides flexibility to the final Gelish Dip colour powder layer. To be applied after the second coat of Gelish Dip coloured powder and again after filing and shaping, prior to applying Gelish Dip Top Coat. Gelish Dip Top Coat: The final step in the Gelish Dip System. After application of all Gelish Dip products, apply two thin layers of Gelish Dip Top Coat. Contains vitamins A & E & calcuium to nourish and condition the nails. Gelish Dip Nail Restorer. A solvent based solution used for the quick and easy removal of excess Dip Base or Top Coat product from brushes. Place hardened or thick brush in solution and soak until softened. Allow brush to dry before placing back in original bottle. Gelish 100/180 Buffer: Is used to shape, buff and prepare the nail prior to the application of top coat. Includes 3 Bonus items: 1. Orangewood Stick. 2. Mini Wooden File. 3. Plastic Pusher. 4. 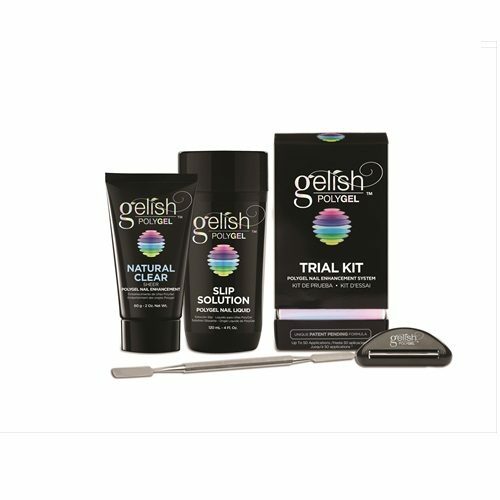 Prep Tabs The Gelish Mini Basix Kit includes all of the essential products necessary to properly apply Gelish Polish from begin to end. 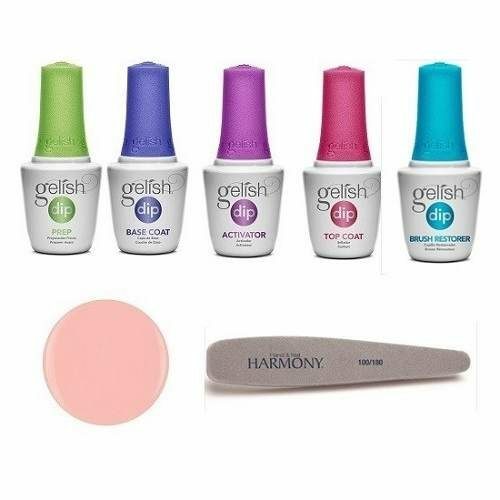 The Gellish Mini Basix Kit includes: Mini Gelish PH Bond Mini Gelish Foundation Mini Gelish Top It Off Mini Gelish Nourish Mini Gelish Cleanser Mini Gelish Artificial Nail Remover All you need to do now is choose your favorite colour gels and start applying Gelish! Please Note, this Basix Kit does not include a light, in order to cure your Gelish Manicure, you will need the Gelish 18G LED Light or the The amazing New Professional Premium LED light..